Another Wednesday, another craft brew recommendation handpicked for you, Pint Jockeys. Put on some country music and get ready to giddy up, because we’re returning to our Texas roots. Today, we’re focusing on a craft beer brewed with pride in the heart of Texas – ZiegenBock Amber. ZiegenBock is a true beer of the South. This American-style amber lager offers notes of roasted grains in the aroma, a sweet, smooth taste and a hop finish. The select imported hops and specialty malts create a flavor worthy of the 2006 Great American Beer Festival Bronze Medal. It’s no surprise that a beer with a taste big enough for the Lone Star State also puts on its own music festivals to celebrate all things, you guessed it, beer and Texan! So keep your ears peeled for the sweet sound of country music coming to a city near you this Fall. Can’t wait ‘til the festivals and want a taste of the ice cold, Texas-brewed craft beer by the same name right now? Look no further than your refrigerator or favorite bar, because ZiegenBock is available in bottles and on tap. Put your cowboy boots on, grab a few friends and let the Texan in you run wild, because no matter where you are or what you’re doing, the taste of Texas is just an arm’s reach away. Born and Brewed in Texas: A Look at the February Tasting Lineup! 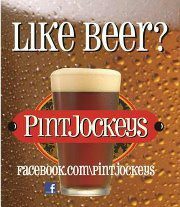 Don’t miss tomorrow’s free Pint Jockey Tasting! We’ve been so wrapped up in all of the Mardi Gras festivities here in Southeast Texas that we almost forgot about another very important date that’s right around the corner – Texas Independence Day! Luckily, the Pint Jockey’s February tasting event, scheduled for TOMORROW evening, is all about Texas and will give attendees the chance to find their favorite Texas-brewed beer just in time to for the big day on March 2! As Texans, we love our state. Of course, one of the things we love most is our abundance of quality beer. Representing the Texas brewers during tomorrow’s tasting will be Rahr & Sons, Saint Arnold, Southern Star and Zeigenbock. We’ve included a brief description of all the beers below. Rahr & Sons Iron Thistle – There’s a reason why we named this the February BOTM! This dark, seasonal Scottish ale has a bold taste dominated by a smooth, sweet maltiness and a touch of hoppy bitterness. Deep, dark brown in color, the brew is crafted from warrior hops, Vienna, crystal and chocolate malts creating a deeply malty, nutty and caramel flavor. Saint Arnold Spring Bock – Brewed to a high starting gravity and high alcohol content, this true German-style Bock celebrates the coming of spring. This big, deeply flavored lager has been aged to create a smooth, malty taste with a hint of sweetness. A light addition of German hops balances the malt flavor. Saint Arnold Brown Ale – The full, malty body and deep copper brown ale was released in 1995 to commemorate the brewery’s one-year anniversary. Brown Ale is brewed with five different types of malts and has hints of chocolate and a touch of sweetness creating the perfect balance. Ziegenbock – This American-style amber lager has a beautiful dark amber color with notes of roasted grains in the aroma and a sweet smooth taste with a balanced hop finish. Rahr & Sons Snowmaggedon – A tribute to the rebuild of Rahr & Sons brewery from the snowstorm in Fort Worth on Feb. 12, 2010. This seasonal American, double imperial stout comes in at 10.00% ABV and pours a deep brown color with light brown hues. Some slight roasted notes are present along with a bit of coffee and a touch of chocolate and malt taste. Southern Star Bombshell Blonde – This American Blonde Ale from Southern Star Brewing Company is a rich, creamy, golden-colored ale fermented at a cool temperature to give a clean finish. Hints of yeasty bread and a touch of hops combine to make a beer that is truly more than the sum of its parts. As this is our seasonal post, we’ll have to call special attention to our Beer of the Month, Iron Thistle and Saint Arnold’s Spring Bock. Both are delicious, but we encourage you to come on out and taste for yourself. If you haven’t attended a previous tasting, the events are open to attendees ages 21 and up and held at the Del Papa Distribution Centers in Galveston, Beaumont and Victoria. For more information, click here. Come get a jump-start on the last weekend of Mardi Gras and gear up for Texas Independence Day. Two great reasons to join! Bottom’s up fellow Pint Jockeys! We look forward to seeing you tomorrow!